Jana of Cherry Tea Cakes was our July Daring Bakers’ host and she challenges us to make Fresh Frasiers inspired by recipes written by Elisabeth M. Prueitt and Chad Robertson in the beautiful cookbook Tartine. 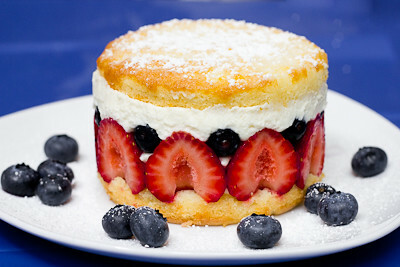 The Frasier is a light, moist layered chiffon cake, split and filled with sliced fresh fruit and pastry cream, then topped with a thin sheet of almond paste. I love fresh fruit and this challenge was the perfect way to showcase some of summer's fresh fruits! I omitted the optional layer of almond paste on top, mostly just because I didn't have any on hand, but followed the rest of the recipe exactly. 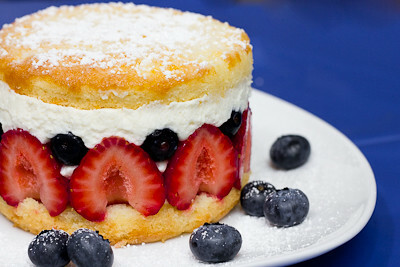 I made an orange chiffon cake and filled it with strawberries and blueberries. I made the simple syrup with 2 tablespoons of orange juice and 2 tablespoons of triple sec. I was concerned the flavor of the alcohol would be too strong if I added the full 4 tablespoons of alcohol, but in retrospect I think it would have been much better that way. Regardless, this cake was amazing. The chiffon had an incredibly light but moist crumb. (It is also special to me because this was the first time that my 20 month old helped me make a cake! She helped mix the cake batter (before the egg whites were added!) and it was so great to see how much fun she was having helping her mommy out.) The pastry cream was delicious, though I think calling it a "pastry cream" makes it sound heavier than it actually is. Most pastry creams are made with multiple egg yolks (thus lending them their richness); this one is made with just one whole egg. So it's more like whipped cream with a little pastry cream added in. This keeps the dessert from being too heavy, and adds just a touch of richness to it. I basically loved everything about this dessert. Just look at all those fresh berries swimming in pastry cream! Yum! While this dessert is compromised of several components, each part on its own is very simple and you can make each individual component ahead of time and then assemble it all when needed. Plus, if you are short on time, you can just make a trifle with the cake, fruit, and pastry cream! It's every bit as good without any of the fuss. Thanks Jana, for hosting this month's challenge. I've never had or made a Fresh Frasier before, but I fell in love with them and definitely plan to make them again in the future! Make sure you check out the Daring Bakers' Blogroll to see how everyone else enjoyed this sweet, summery treat. - When cutting parchment rounds for your pan(s), don't forget to check out my helpful tip here! 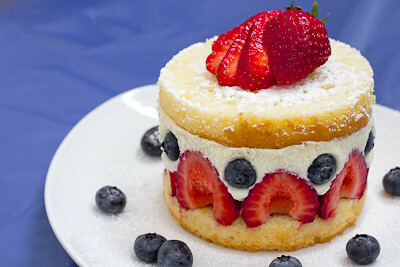 - Please note that the cake, like all chiffon cakes, will rise quite a bit, so do not overfill your pan(s)! You only want to fill them about half way, or two-thirds at most. - Baking time was approximately 30 minutes for the mini cakes. In a stand mixer, fitted with the whisk attachment, whip the cream until it holds medium-stiff peaks. Fit the bottom layer into the prepared spring form pan. Moisten the layer evenly with the simple syrup. When the cake has absorbed enough syrup to resemble a squishy sponge, you have enough. Your Fraisier looks fabulous. Love the mini size. Now I want to buy a mini pan or two. Wow! These look fabulous :) I'm tempted to make them for my daughter's birthday. WOW!! Jaime, your Frasier is stunning!! 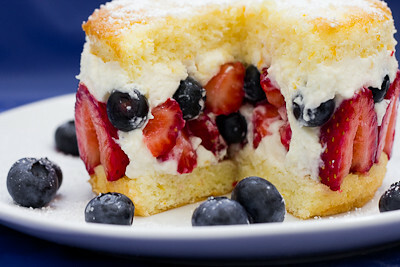 What a perfect summer dessert...and I love how simple each of the components are. The results are unbelievable....really a show-stopper. Beautiful job with this one! Ohh looks so delicious! Great job on this month's challenge! Your little frasier is really cute! I love your tiny little Fraisiers...so sweet! I agree that pastry cream is a little heavy sounding for the lightness, at least texture-wise, of the filling. SOOO good! Your Fraisier looks incredibly yummy and the photos really do it justice! Congratulations! Mmmm...this looks delicious. Thanks for the recipe for the cream filling - definitely going to try this...looks too good! Oh these sound delicious and your photos are stunning, awesome job! this. is. gorgeous. it's truly perfect, jaime. although i have to admire it from afar, i can appreciate all the time and effort you put into it--bravo! WOW! That is absolutely gorgeous!! !